My pump was buzzing real bad every time I was on the gas, plus engine was stumbling and hesitating around 3000 RPM - when checked, fuel pressure was as low as 20 PSI @ idle. A brand new Nissan OEM fuel pump is ~$220 from Courtesy Nissan. Note: Make sure the battery is disconnected, and you're NOT smoking! Make sure you have a fire extinguisher close by just in case!! I'm NOT joking!!! 1. 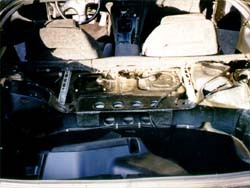 Remove all trunk interior panels. This includes 3 rear panels, speaker covers/side panels, and the plastic lids behind both seats (phillips and 10mm). 2. 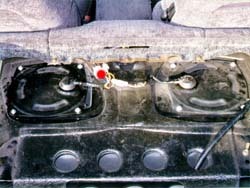 Remove the tray behind the seats (phillips and 10mm). This will expose the top of the fuel pump, sitting right behind drivers seat (1.). 3. 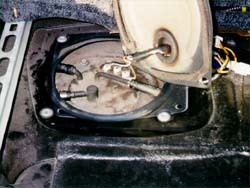 Disconnect both fuel pump harness connectors, they should be under the tray (red dot in 2.). Remove the lid (4 x phillips). Carefully move the lid to the side. 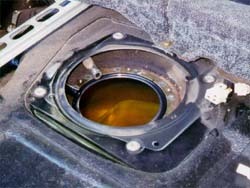 Open the gas tank cap to release air pressure in the fuel tank. 4. Remove the clamps and carefully pry off fuel hoses from the top of the tank (3.). These hoses are pretty tough, and I used pliers (not sharp ones) to get the old ones off, by moving them side to side. Do not cut them, they will have to be used later. Once the hoses are loose, use blunt object to pry them off. This part is pretty nasty and hard to do, so be patient. 5. Remove the bolts holding the pump assembly to the tank (6 x 8mm). 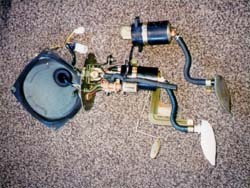 Carefully wiggle the pump assembly out of the tank. Cover the exposed tank opening with a shop towel to make sure no debris falls in (4.). 6. Remove the old pump and fasten the new one inside the bracket. This is pretty straight forward, there are 2 brown pins on the side, and 2 power wires, plus the pump can go in only one way. Just look at the old one, and put the new one in the same way. Make sure to reconnect or move back into position any parts of the assembly that might have removed/moved. In my case I had to disconnect some kind of black tube, to access one of the screws. Make sure all is nice and tight. (old pump on top, new one on bottom attached to lid 5.). 7. Carefully place the pump back into the tank. Don't forget the rubber sealant ring, it sits under the fuel pump bracket, and prevents vapor leaks. The ring might get pinched or otherwise damaged, be careful with it. This might be tricky, so be patient, and don't bend or break anything. Replace the 6 8mm bolts. Reconnect all 3 fuel lines. Don't forget the clamps, they should go on before sliding the tubes. Use some WD-40 to lubricate fuel hoses and carefully slide them back on. 9. If everything is right, then re-install the interior panels.